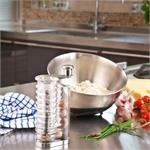 Slice, shred, and grate from fine to coarse with this six sided stainless-steel grater. 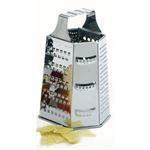 This grater stands 8.75" tall and is dishwasher safe. Create perfect lattice pastry for pies, cut even slices of dessert bars, or slice pasta for ravioli and lasagna. The width is easily adjusted a twist of the handles into the appropriate slot, with each size clearly marked in both imperial and metric. Over 300 V-etched teeth and a non-stick coating on the Better Zester allow you to effortlessly glide rough citrus fruits over the surface. 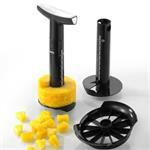 A one-of-a-kind squeegee cleans the back side of the blade as it moves the zest for deposit directly into your dish. 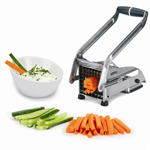 The original and still the best - This German made mandoline is one of the fastest and most uniform ways to slice, dice, julienne, shred or grate most fruits and vegetables. A simple push button makes 10 different cuts with adjustable thickness. The unique double hopper design gives you unlimited options for grating and slicing when you use it in tandem with the 2 different stainless steel grating/slicing drums. Also includes a corn stripper drum that quickly removing kernels from the cob. Carrot curls are great can be used to make carrot 'roses' to dress up a salad. 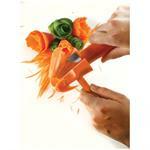 To use simply use like a pencil sharpener to "sharpen" the carrot. Try on english cucumbers, zucchini or parsnips for long ribbons for salads and garnishes. 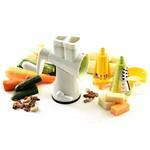 The Starfrit Electric Spiralizer makes eating your veggies fun again. This is the perfect appliance to effortlessly transform fruits and vegetables into spirals and ribbons, adding a twist to everyday meals all at the push of a button. 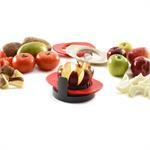 With 3 interchangeable blades the Fruit Wedger/Corer you can easily prepare healthy snacks. That tricky mango seed is no problem with the mango blade. The second blade wedges & cores apples, etc. while the serrated tomato blade cuts tomatoes. The Comfort Pineapple Slicer includes 2 cutting tools, a medium size and a larger size to accommodate most sizes of pineapples. Cut the top off a fresh pineapple & screw the blade down for perfectly sliced and cored pineapple rings. Efficiently slice uniform french fries with one simple move. Insert cutter into base and lock into place. Use pusher to push potatoes through the blades. 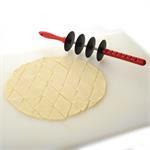 This tool also works great for cutting vegetable batons for party trays. Grip-EZ® handles allow for a stronger grip to prevent hand fatigue and cramping and are raised up to keep hands away from the blade. 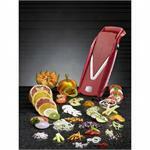 The slicer/wedger cores and slices fruit into eight sections and removes core in one easy motion. Dishwasher safe. The unique design and material of this cheese knife keeps your cheese on the plate and not stuck to the knife. 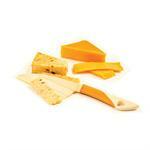 Not just for cheese, try it on anything that typically sticks to a knife blade such as boiled eggs, cakes, butter, etc. 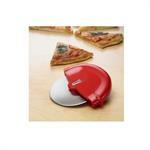 Tough enough to slice through crusty pizza or flatbread, steady enough to use when cutting pastry or pasta. Gentle enough to use on non-stick cookware or pastry mats without scratching.tapered cutting edge and scallops on wheel surface prevent sticking. 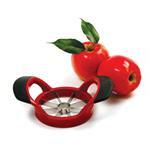 Precision stainless-steel serrated blades and Grip-EZ® handles make this vegetable/fruit wedger quick and easy to use. 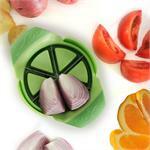 It is ideal for onions, tomatoes, potatoes, lemons, limes, and oranges and makes six perfect wedges with one press. 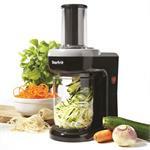 The herb mill will chop or mince parsley and other herbs for the freshest tasting salads, dips, casseroles and more. 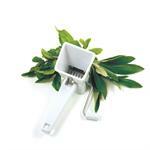 Stainless-steel blades pull herbs from the small hopper and chop them into fine pieces. This grater has 4 types of stainless steel grating blades - coarse, fine, extra fine and star arranged in a pyramid shape around a raised handle. When the grater is not needed the blades store inside the container, keeping them clean & your fingers safe. 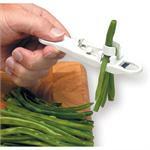 Sharp blades cut green beans into French style strips as you push/pull them through the hand held bean slicer. 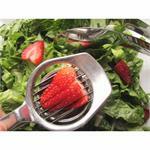 The stainless steel blades of the mushroom/strawberry slicer quickly cuts even, smooth slices every time. It also works on kiwis, hard boiled eggs, and mushrooms. This handy little spice grinder is ideal for nutmeg, ginger, peppercorns, and rock salt. The only thing better than the smell of fresh ground spice is the taste of the finished product. Ground spices can be stored in the grinder body. 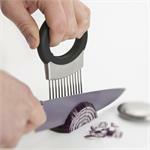 The Onion Holder & Hand Odour Bar will have you slicing onions like a pro while keeping your fingers safe and smelling fresh. The spikes guide your knife for consistent and even pieces when dicing onions, slicing potatoes and other vegetables. With no sharp edges to dull or damage your counter tops the Outset® Pizza Cutter cuts pizza's quickly, cleanly and evenly. 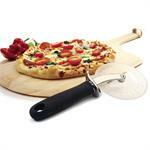 Combine with the Outset® Pizza Peel to have a matched set. Save time, save grime, and save fingers. 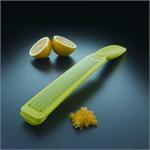 No more nicks and cuts and food under your nails when working with sharp knives, mandolines & graters. Slim fitting ensuring comfort and control for both right and left handed use and great for the craft room too. Mountains of curly fries, piles of zucchini pasta and eye catching salads with ribbons of cucumber. Make eating your veggies fun again. 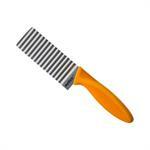 Includes 3 blades for cutting ribbons, and thick or thin strips. 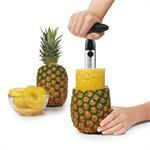 Quickly and easily slice and core fresh pineapples with this ratcheting slicer. Just line up the center core to the shaft of the slicer and start twisting the cutter, the ratcheting handle puts less strain on your wrist and hands as you cut. 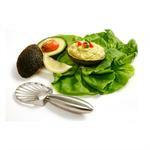 Create perfect avocado slices for sandwiches, salads and snacks in one smooth motion. Simply cut your avocado in half and remove the pit. Hold it in your hand, skin side down and slide the slicer from one end to the other. The Garlic Chop™ can mince up to 4 garlic cloves at one time (depending on size) with a few simple twists of the wrist, more you twist, the finer the mince. 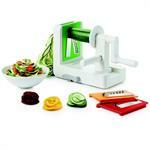 The pop-up button makes removal of chopped pieces easy. 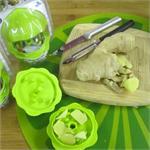 Great for mincing ginger and hot peppers. With just the right amount of rigidity and flexibility, you can quickly and effortlessly layer on, or smooth out, any slippery, soft, or semi-hard spreads. 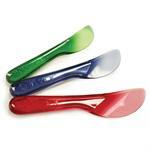 Set of 3 includes 1 spreader has a serrated edge for cutting buns and baked goods. 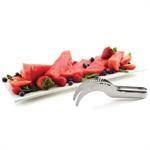 This stainless steel Watermelon Cutter easily and neatly cuts, lifts, and serves watermelon and other melons straight from the rind. 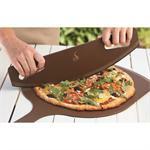 Great for picnics and barbecues as there is less mess and less waste. Constructed with a high quality stainless steel blade and an ergonomic soft grip handle, this knife will easily cut through hard vegetables such as potatoes, sweet potatoes, carrots, and more. Kids love their veggies and fries cut into wavy crinkles! 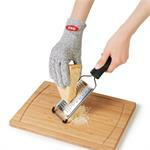 Palm-held grip allows pressure to be applied directly onto the stainless steel cutting wheel for easy slicing. Designed to snap open for easy cleaning, the handle and blade separate and can be popped into the dishwasher for quick cleanup.